Pathfinder: Kingmaker, the cRPG funded via Kickstarter and launched in late September for PC (Windows, Mac and Linux) by developer Owlcat Games and published by Deep Silver, is being worked on for a release on PlayStation 4, Xbox One and Nintendo Switch consoles. There hasn’t been a proper, official announcement yet. 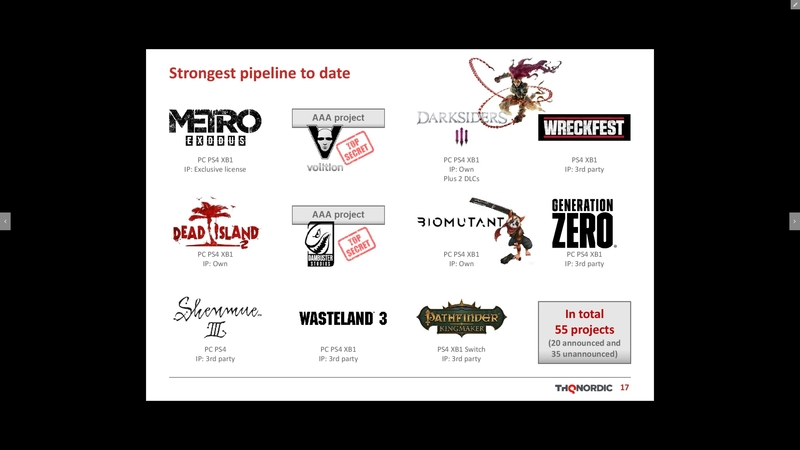 However, THQ Nordic’s latest financial report (where they also revealed the studio acquisitions of Coffee Stain and Bugbear Entertainment) included the title in a slide mentioning the most important announced projects in the pipeline, such as Metro Exodus, Dead Island 2, Wasteland 3, Shenmue III, Biomutant, Darksiders III, Wreckfest, Generation Zero and the console port of Pathfinder: Kingmaker. There are also two AAA, ‘top-secret’ projects by Volition and Deep Silver Dambuster in there. Deep Silver, as you may recall, was acquired by THQ Nordic alongside Koch Media earlier this year, so it’s perfectly normal to find Deep Silver titles in the report. We got in touch with Deep Silver and they were able to confirm that this is not a mistake, though additional details will only be provided at a later moment, in due time. Fans of Baldur’s Gate who love to explore the deep systems and thick spell books may truly love this game. Fans of unforgiving real-time combat will really enjoy this game. Fans of dense, high fantasy worlds filled with interesting locations and long quests might like this game, too, if they can get their head around the more complicated parts. Pathfinder: Kingmaker is a good game and a really fun experience but players need to know beforehand that it is not a very accessible game. Before playing you should be fully aware of how much of a mental and time sink Pathfinder: Kingmaker instantly becomes, and if that doesn’t put you off, I think you’ll really dig it.